bbc.comThe sub-10 second bursts of brilliance are gone but, track exploits apart, Usain Bolt is still living fast.The Jamaican spent the early hours of Thursday morning amid a haze of dry ice, camera phones and free cognac, DJ-ing at a Gold Coast nightclub that skimps only on uniforms for its female waiting staff.Ten hours later though, hiding behind shades from an unsympathetic sun, the Jamaican's endurance was being tested. What about the possibility of his ninth Olympic gold being returned to him via relay team-mate Nesta Carter's appeal? "I have moved past that now, just waiting for the verdict".On the absence of a string of big stars from the Commonwealth Games? "They were always very important to me, but everyone makes their own decisions for their own reasons. "There were moments where his warmth and wit shone through. Told that the world was still "obsessed" with him despite him hanging up his spikes, Bolt silently gripped a fist in celebration.One journalist asked if he was right to think that Bolt could yet return for Tokyo 2020. "You are very wrong," Bolt shot back immediately. Bolt - see here with Hollywood actor Chris Hemsworth - remains very much a star attraction at a Games where he is not even competingBut Bolt's appearance at the Games was more about the mere physical fact of him being here. The trademark Cheshire cat grin broke across his face as he posed for photos, there was a flurry of camera shutters, and everyone left happy.Eight months after his retirement, the circus, in thrall to Bolt's class clown-turned-ringmaster magnetism, is still drawn in. Those organising and paying behind the scenes hope that, via the media scrum that surrounds Bolt, some of his carefree charisma radiates out to the causes he is promoting.His groaning sponsorship portfolio includes an Australian telecoms company. He is an ambassador-at-large for Jamaica, promoting his home nation to the world. 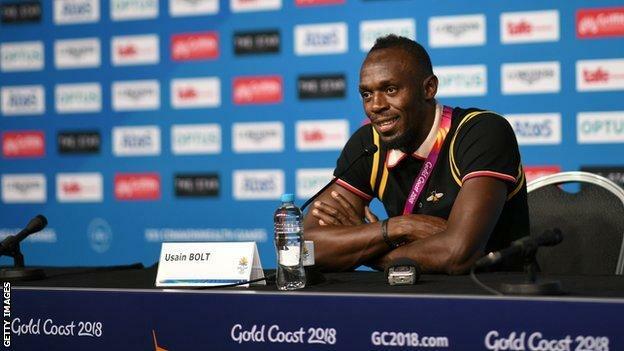 Gold Coast 2018 were in talks with his advisors nearly a year ago to make sure that he attended in his new non-competitive capacity.It is unclear quite what the cost of bringing Bolt to the Games came to and how it was shared. Commonwealth Games chief executive David Grevemberg said only that it was "nothing exorbitant".Especially considering what Bolt provides.On Monday night at the Carrara Stadium, Cathy Freeman, the centre of Australia's seminal sporting moment when she won 400m gold at the Sydney Olympics, was interviewed on the track.On Tuesday it was the turn of Anna Meares - a local girl, born in Queensland, who left cycling as a multiple world and Olympic champion. Many things might have changed now that Bolt has retired - but the huge smile is still refreshingly presentTheir reception from the crowd was warm, polite and respectful. For Bolt - whose only Commonwealth Games appearance was as a relay anchor on a rainy evening in Glasgow four years ago - it was something a little closer to mania when he presented the final set of medals at the same venue on Thursday night.IAAF president Seb Coe, speaking earlier this week, was not the first to compare Bolt's human connection to the legendary Muhammad Ali.Ali used his lofty platform differently though. Bolt never strayed into the polemic and political - the difficult, tangled human matter that made Ali a personality that resounded far beyond his days in the ring.Maybe that will come. Bolt is still 31, a young man finding his new niche.For now though, without a chorus line of staggering sporting acts in the background, the Bolt sideshow, at least on this scale, may be on a limited run.